Today I'm excited to introduce you to Myray Reames, the owner and mastermind behind Myray Creative. Myray and I initially connected on Instagram last month (are you sensing a trend with how I make business friends?! ), and immediately bonded over our similar aesthetic tastes, past experiences working for advertising agencies and recent forays into freelance life. In February 2018 I'll get to meet Myray in person when we attend Create Cultivate's conference in LA, which I'm really looking forward to! Keep reading to learn more about Myray's creative upbringing, how she initially discovered her love for photojournalism, and how she's harnessed her photography and design skills as an art director for multiple brands. Q: Share a bit of your story with us: what experiences in your education and professional background led you to pursue art direction with an array of creative agencies over the last few years? A: Growing up, I was always a visually creative person. My neighbor was an illustrator for National Geographic, so I would spend countless hours learning all types of art in his studio. My dad is an arborist and shapes living trees into chairs and tables. So I came from a creative environment, surrounded by a family of entrepreneurs who supported every artistic interests I had. I became interested in photography in middle school. One of my photos even won Best-in-Show at the County Fair, which gave me a lot of confidence. That’s when I decided I wanted to be a photojournalist. I ended up stumbling into working in advertising as a career. At the University of Oregon, I was studying photojournalism and decided to take an intro to advertising class just for fun. I was hooked. I learned that as an Art Director not only could I work with photographers but I could use graphic design and art, and also I could tell stories and solve problems. I added advertising as a major, taught myself graphic design, and put a portfolio together. At one point I was the director of our in-house ad agency and the photo editor of our school magazine. I loved doing both. Right out of school, I was lucky to get a job as an Art Director in San Francisco at Pereira & O’Dell where I worked on Skype and a bunch of other major brands. I ended up getting laid off when Skype left the agency, so then I moved to Creature in Seattle where I worked on Amazon. The company ended up closing down. After two job losses in two years, I was like, "This is crazy; I want to be my own boss." That’s when I started freelancing for ad agencies, and consequently I’ve worked at six agencies in the last year. I've started to work with individual clients and small businesses, too. I recently did all the branding and photography for a jewelry company in Portland. I loved the creative freedom I had and the fact that I was helping an amazing woman start the company of her dreams. The branding and photos have really helped her stand out from her competitors. That’s where I’m at now, doing a mix of work for agencies and my own smaller clients. A: Oh my gosh, every day and every week is so different! Honestly, I don’t have a routine. I wish I did. I switch off working a few weeks at an agency and then having a week to myself to work with my own clients. I thought freelancing would give me more freedom to do personal projects, but they always seem to get moved down to the last things on my priority list. But I've found if I collaborate with another creative on a personal project then it’s a lot more likely to get done. On an ideal day if I am working at an agency I get up early to get to the gym, work on my personal projects for a little bit, then go into work. Sometimes my own work gets pushed to nights and weekends. It changes all the time. If I’m not working at an agency, I will go for a walk in the morning, then work at home or a neighborhood coffee shop. It’s been a struggle learning how to manage my time when I don’t go into an office. Sometimes I sleep in if I need to or go to the grocery store in the middle of the day. Then I’ll just work later and adjust my schedule. I’m still not sure if that’s the best thing for me, but it feels good to have that freedom, so I’m taking advantage of it. Q: What are your go-to tips and tricks for finding alignment during an otherwise crazy day, and what are your passions outside of work? A: I’ve recently started using Inkwell Press' daily planner and their daily download notepad. I like to physically write out my day in there in the morning. Then I use my daily download notepad at night to reflect on what went well, what I’m thankful for, how I’m working towards my goals. They are great mindset tools that make your workflow objective, so you don’t get too hard on yourself for not getting enough done. The other things that are so important for me to find alignment are working out and eating well. A walk in the park or a yoga class are things I do every day during the week. Seeing trees helps calm my mind down. The other thing I do is read fiction before bed. It tires out my brain, or else otherwise I tend to think ahead and stress about what I have to get done the next day. What I do to stay aligned and my passions are so similar! Exercise is amazing. I started going to ballet classes when I was six – I was in the Nutcracker every year until I was 18. I studied modern dance in college. I still love dance, but it’s harder for me to make it to classes regularly. Now I do yoga because it’s easy to do everywhere. It is great for my body and mind. I love having exercise goals to work toward too, for example, this year I learned how to do a handstand! It makes the whole process more rewarding. My other passion is hiking in nature and camping. My fiancé and I usually get out of San Francisco and hike on the weekends. Because we are both freelancers, we were able to make a last minute trip up to Oregon and go backpacking for the solar eclipse this year! What an amazing experience. When I’m busy, Golden Gate Park will have to suffice as my nature outlet. Q: What brands do you admire in the digital space for their innovation and creativity in marketing? A: How to choose! I love how Glossier built a cult millennial beauty brand by doing two things: 1. Adding value to people’s lives on their blog and 2. Having a cutting edge look and feel that speaks to women – not at them. I love Airbnb for creating a digital product that’s played out in real life. They are growing so much because their marketing is all about real storytelling, standing up for global issues, and solving problems. They are a brand with empathy and courage. R.E.I.’s marketing is also killing it. They are doing amazing long-form storytelling content with women in the outdoor industry. Also, their opt-outside campaign blew me away, since it's such a simple idea that made everyone think twice about shopping on Black Friday. "Start telling people what you want to do, do it, and soon enough you will be known for it." 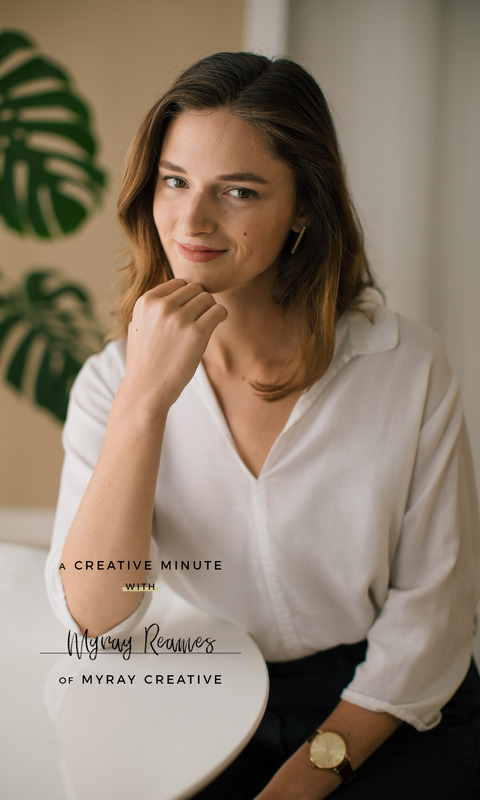 Q: For fellow women who are seeking a creative outlet or want to pursue their own creative freelance pursuits, what would your greatest piece of advice be? A: My biggest piece of advice would be just to start. Done is better than perfect. If you are in a job you don’t like or are not sure what you want to do – just start something. I felt stuck for a while when I was only working at agencies. I felt like there was a big creative and curious side of me that was missing in my everyday work. But I felt trapped in my daily life and wasn’t sure what to do about it. It took a lot of podcast listening, motivation, and mindset work to be able to realize that I can do more. There is a huge creative community of women entrepreneurs out there! And they are successful! You can be, too! Keep up with Myray's work on Myray Creative's official website and on Instagram, @myrayreames!